I attended an English play Yayati, last Friday. Pune has a vibrant theatre movement and almost all shows are full house performances. Marathi being the most popular language, followed by Hindi and English. I used to be a regular play goer in the nineties but stopped after 2002 about which I shall write later. Yayati is a play based on a character in our Epic, Mahabaratha. His story was adapted for the stage by Girish Karnad, one of our noted playwrights many years ago in Kannada, one of our local languages. He was requested to translate this into English to enable a drama troupe based in Bengaluru Jagriti, to stage the play there. 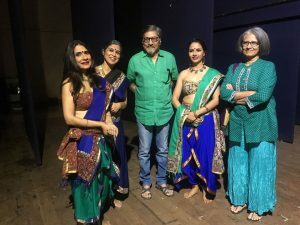 Having successfully run there, the troupe brought it to Pune as part of a local drama festival and Manjiree, Ranjan and I went to see it last Friday. This photograph shows the cast, crew, playwright and the director taken in Bengaluru. 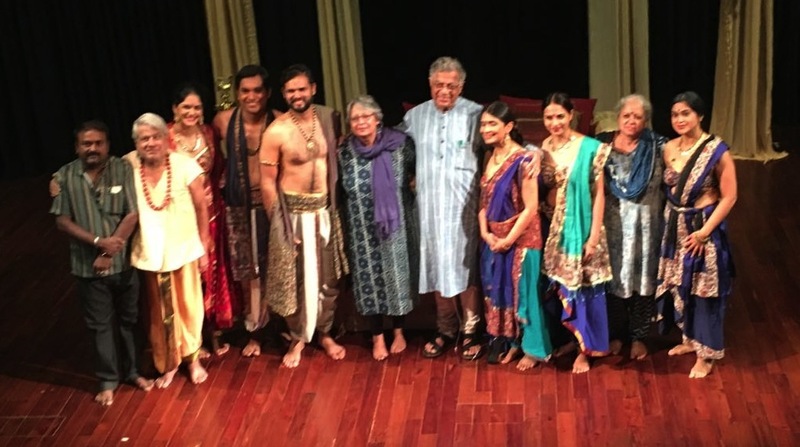 Girish Karnad is the tallest male there. 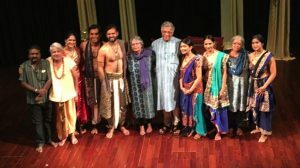 This one shows some of the cast on stage after the show in Pune. The gent in the middle of those ladies is another stage and film celebrity, Amol Palekar who had come to see the play. His wife, screenplay writer Sandhya Gokhale can be seen at the extreme right. Normally speaking wild horses would not have been able to drag me to see a play in any of our theatres here. I stopped going to see plays as, the seats are inevitably uncomfortable and my replaced/revised hip joints makes it physically uncomfortable for me. Yayati however was special and despite knowing that I would be uncomfortable, I went to see one of my all time favourite ladies. She features as the last one on the right in the top photograph and the second from the left in the bottom one. She is Vandana Prabhu, my very talented niece who not only is an accomplished actor but, also directs plays. How could I not attend a play with her acting in it and being staged in Pune? The play was brilliant and so was Vandana. The entire cast were remarkably professional and their delivery of dialogues and monologues were totally fault free and smooth. I thoroughly enjoyed the show despite the discomfort of the seats. This entry was posted in Family, Relationships and tagged Benglauru, Girish Karnad, Jagriti, Kannada, Pune, Vandana Prabhu. Bookmark the permalink. I remember your posting about your niece! she’s beautiful and so accomplished. the thing that struck me most about it was following the links and discovering that … Girish Karnard is 79 years old! still creating and working on his passion! and Amol Palekar who is also in his 70’s! and doesn’t even look it! amazing. the arts allow people to work happily long into their lives. now if those seats in the theater could just be better upholstered for you my friend! Yes, these guys besides a host of other creative types here live long and stay active till the very end. Perhaps it is their lifestyles that enables them to be so. I am glad you enjoyed it. Your niece is lovely! Thank you. My niece played a role of an old woman and was made up for that role. In real life she is stunning! You didn’t mention the plot of the play. And how kind you are to go to the play and see your lovely niece. It is hard to be comfortable when the body needs a different arrangement. I love the theatre but some seats have been torture for me too, especially hard ones. The plot of the play is in one of the links. The problem is not with the shape of the seats Cathy. The problem is inevitably one of size and design of the rests on the sides. oh I understand that completely …. I can never understand why they use some sort of generic seat and expect it to be “one size fits all” ….